The sign reads, “Say Goodbye to Ordinary French Fries!” Amid garish greens and yellows, deep fryers and drawings of potato slices on sticks, a fast food worker looks at the floor. He wears a blue surgical mask over his mouth and stands in front of one of the food illustrations, which gives the impression of piles of potatoes on his head. This is part of the series "Chinese Fast Food," photographed by Anja Hitzenberger during her two-month residency in Beijing in 2011. As a photographer who is interested in what people eat, Anja spent several weeks photographing the food stalls at the Olympic Stadium. While American fast food is only relatively new to China—the first and most popular brand, KFC, opened in Beijing in 1987—these stalls were meant to be representative of traditional foods from different regions of China. The resulting photographs create a world of sensory overload: saturated color, bored workers and processed food. Atlas Obscura spoke with Hitzenberger about this project. Where did you get the inspiration for this series? A lot of my work is about the relationship of the body to architecture and space, but I also work with themes that relate to food and what people eat. In 2011, I was in Beijing for an artist residency and I went to the Olympic Park to look at the stadiums there—the park is very large and it’s mainly a tourist attraction now that the Olympics are over. In the park I discovered a temporary tent with a food court and I was really intrigued by these small, totally artificial confined spaces. How did you go about shooting it? I photographed in the tent several times over a few weeks. I found the contrast of the bored workers to the busy and overloaded visuals that surrounded them fascinating and I tried to emphasize that in the pictures, which probably comes out best in the image “Chinese Fast Food 01 (aka Red).” I photographed the series handheld, because I didn’t want to risk being thrown out for being too visible using a tripod. 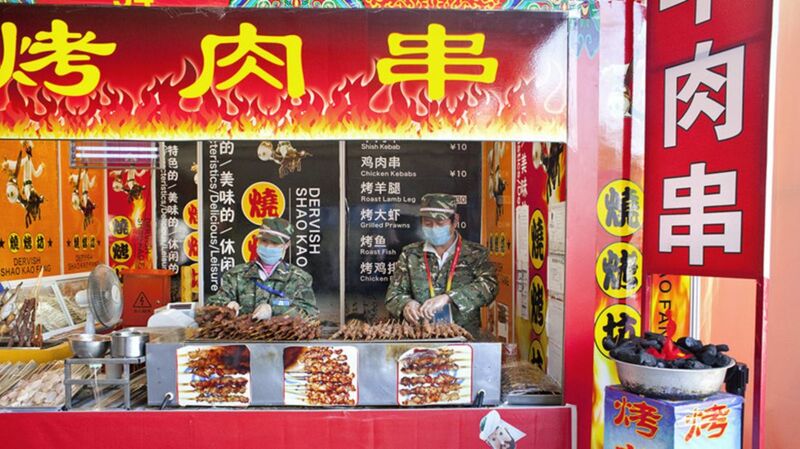 The food stalls were in Beijing’s Olympic Park –how was the experience of shooting there after the Olympics had been and gone? China hosted the Olympics in 2008, and the park with its stadiums was built especially for that. It’s a very large area and I’m not sure if they still have sport events there, but I think it’s mainly a tourist attraction now. To me it felt quite surreal to be there, so vast and so much empty space within this very crowded and dense city. The “Bird’s Nest” stadium is a fascinating structure, both inside and out, and I felt like a tiny little ant being in this gigantic building, almost completely alone. How willing were the people working to be photographed? Did you speak with any of them about their experiences? Unfortunately, pretty much none of the people working at the stalls spoke English (and I don’t speak Chinese), so I photographed most of them without any interaction. Some of them didn’t even notice that they were being photographed, because they never looked up. Others just gave me a blank look or looked beyond the camera, but some smiled at me and wanted me to buy the food they were offering. But nobody complained or tried to stop me from taking the pictures. What differences –and similarities –did you notice about fast food in China and fast food in the US? It’s difficult for me to compare fast food in China and the U.S. because I try to avoid eating fast food anywhere. The meals I was eating in Beijing were generally very delicious, and so one reason I called this series "Chinese Fast Food" was because the food in the tent was not good at all! It was supposed to represent traditional specialties from different regions in China—which some of it was—but in reality most of it was simply badly prepared, processed food like one finds in the US. In China there have been many food-related scandals, including— if you can believe it—fake eggs (machine-made “eggs" sold as real eggs), or fake pork buns (buns filled with soaked pork-flavored cardboard). Were some of the food stalls more popular than others and if so, do you know why? What do these photographs tell us about modern-day China? Fast food has spread around the world very quickly, which is sad. I would love for people to rethink what they eat and I’m hoping that these artificial-looking images will be a bit off-putting for some people. But I feel the images also convey how so many things in China are simply overloaded: too much text, too much color, too much of everything. It all has to be fast, cheap and only temporary. These days, nothing in China is done to last or to stay for a long time. Investigation: Do Bears Get Drunk Off Rotting Fruit?